This non-stick, two-burner griddle turns ordinary rangetops into a complete meal preparation center. 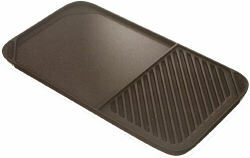 It combines a ribbed grilling surface with a standard, smooth griddle on the same side. Now you can cook both ways at the same time. Crafted of the finest heavy hand cast aluminum for superior heat conductivity. Finished with a premium, long-lasting non-stick surface for fat-free cooking, quick clean-up and durability. This griddle works equally well on either gas or electric stove tops.